The M83723 type jam nut receptacle (M83723/84 & M83723/85 styles) provides increased environmental protection due to its single mounting hole. An integrated silicone O-ring offers additional sealing for environmental installations. 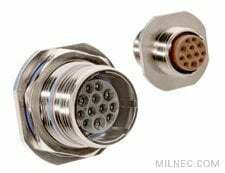 A cover is recommended to protect the connector when it is not in use.